A snap shot of the video shared by a Kashmiri Pandit. At a time when separate Pandit Township is raging a new controversy in Kashmir, a south Kashmir man offered his house for a visiting KP family at Kokernag and invited them to come back and live with him. A video posted on Facebook by one Rajesh Raina showed his wife, Sweeti Raina, breaking down while visiting her parental village in Kokernag. Rainas are currently putting up in Hyderabad. Consoling the lady, the elderly man, is seen offering even his house to the visiting pandit daughter, in case she returns the valley along with his family. 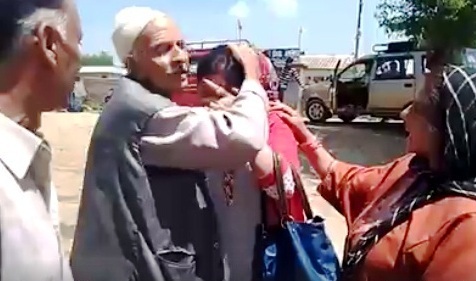 The video, which has already gone viral on social networking sites, set the debate among netizens, who are terming it a “heart warming sign of Kashmiriyat”. Interestingly, the video was circulated at a time when Sainik Colony and separate Pandit Township plans have threatened to snowball into new major crisis in Kashmir. In backdrop of these developments, some are even predicting the resurgence of another simmering summer in valley. “You even have a stake on our blood,” the elder was heard telling the weeping KP lady. by setting separate colonies for kp’s govt once again is separating Hindus & Muslims by building boundary wall between them but this time it shouldn’t happen. Please let Hindu & Muslims live together as Our Kashmir is Known Paradise on Earth not only becoz of its scenic beauty but for its Brotherhood. so don’t play politics…………..
Wright again index finger has been targeted on kashmiri muslims, as far as kashmiri pandits left kashmir, it was preplaned by state government, they organise trucks and transportation to the pundits to shift Jammu as secure place, unfortunately state government fail to get conceqencies problems in future, if any pundit have property exits in Kashmir, they can come and stay there, even if they want build new property they can, kashmiri pundit is scare to do that, because their generatuon won’t like to stay in kashmir, due culture, dress code, etc etc. Now question raise here, why pundits been force back to stay in kashmir?